The US Open Series gears up for another super-charged summer season. The US Open Series—the six-week tennis season that links 10 summer tournaments to the US Open—hits the road this July, featuring the world’s top men and women players and $30 million on the line. As the summer heats up, so will the action for Roger Federer, Andy Roddick, Maria Sharapova, Serena Williams and the other 200 players who are slated to battle it out in this city-to-city chase across North America. It’s bound to be a thrill ride for anyone who follows this summer-long journey because the US Open Series race to the US Open has turned into the greatest road trip in sports. Now entering its fourth season, the US Open Series is fueled by the first bonus points system of its kind in tennis—the US Open Series Lever 2000 Challenge—which links the players’ performances throughout the summer to the US Open. Bonus points are awarded at each US Open Series event, with the top three men’s and top three women’s finishers in the final standings eligible to earn bonus prize money at the US Open. Those who win the most along the way arrive at America’s Grand Slam with the most to win. The men’s and women’s champions of the US Open Series can earn up to $1 million in bonus prize money at the US Open. Last year, Roddick prevailed for the second straight year as the US Open Series men’s champion on the strength of a runner-up finish to fellow American James Blake in Indianapolis and a title victory in Cincinnati. 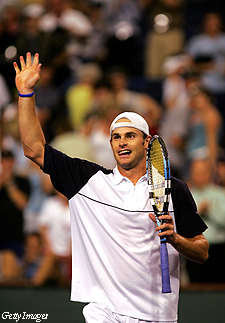 After capturing the US Open Series crown, Roddick advanced all the way to the US Open men’s singles final, which enabled him to take home an additional $500,000 in bonus prize money. Ana Ivanovic clinched the US Open Series women’s championship in 2006 with a title win in Montreal after strong showings in San Diego and Los Angeles. The big winner on the women’s side, however, was Sharapova, who finished second in the US Open Series and added $500,000 to the $1.2 million check she received for winning the US Open women’s singles title. Ivanovic, who lost in the third round at the US Open, earned $40,000 in bonus prize money based on her US Open Series finish. Bonus prize money is just one of several major innovations that the US Open Series has introduced to the sport. New to the US Open Series in 2006 was the use of instant replay technology and a player challenge system for line calls, with the official review provided simultaneously to the players, chair umpire and on-site fans via the in-stadium video screens, and television viewers. The previous summer, the US Open Series debuted a new court color, “US Open Blue,” to heighten visibility of the ball for players, fans and television viewers, and to create a signature look and identifiable link between the US Open Series and the US Open. In addition, the US Open Series has introduced numerous television enhancements, including appointment television with back-to-back men’s and women’s Sunday afternoon finals; “Tennis GameDay” desks at select tournaments; extended high-definition broadcasts; and coverage on ESPN Deportes. The US Open Series has also been offering more national live television coverage than any other summer sport, providing one-stop shopping for fans searching for tennis on television. To assist the US Open Series with that effort, a nationwide advertising and marketing campaign—themed “The Greatest Road Trip in Sports” and prominently featuring international and U.S. players—has been created to generate increased visibility and exposure for the players and the sport. Meanwhile, the US Open Series continues to enjoy record results. In 2006, attendance at US Open Series events rose to nearly 1 million fans, while television viewership doubled from pre–US Open Series numbers to reach 42 million viewers. Indeed, for players and fans alike, the US Open Series is a winning formula that adds sizzle to an already hot summer season.